WTB balances are designed for fast and precise determination of mass in laboratory conditions. They can be used in locations where no power (230V) is accessible as they are equipped with internal rechargeable battery. 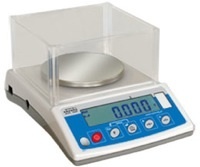 Balances are equipped with stainless steel weighin pan, RS 232 output and backlit LCD display.